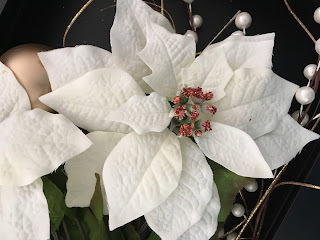 The holiday season is my favorite time to decorate the house and get inspired by the many possibilities! This year I've chosen white poinsettias through out the house. 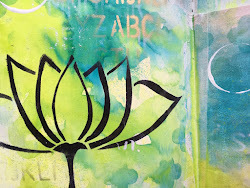 I prefer the white variety because they add a wonderful lightness around the room, especially when combined with lights! 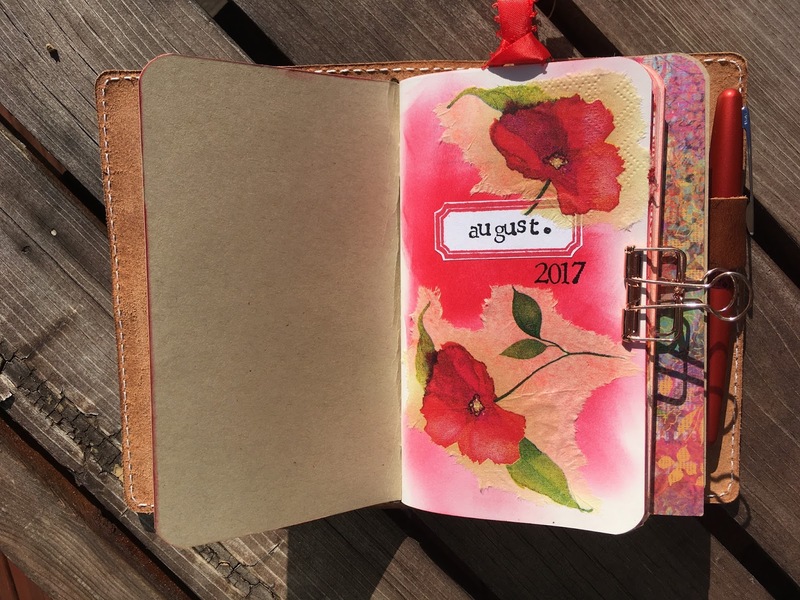 The poinsettias inspired the cover of my December planner, painted with gesso and acrylics, ready to record holiday memories. 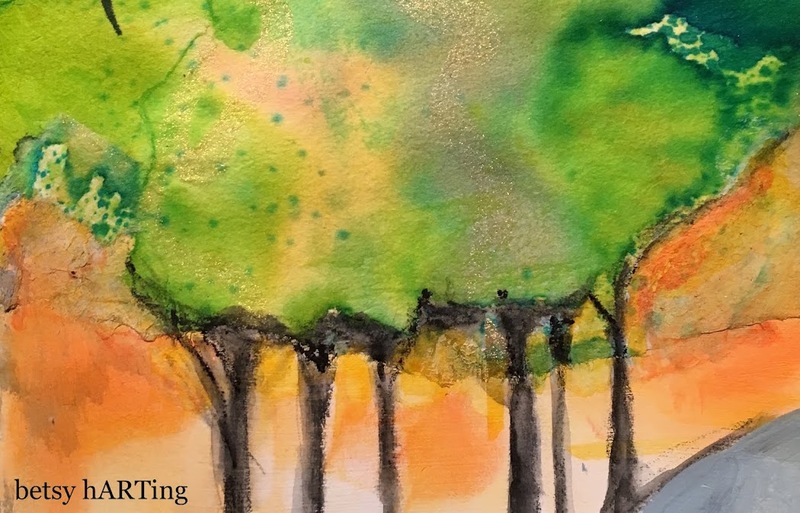 I then painted another version for making prints for my holiday cards while enjoying the different color combinations I could create. 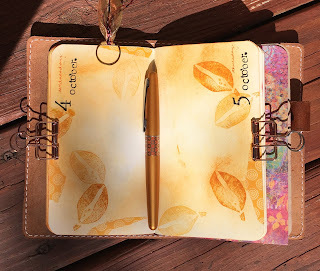 Enjoy the season and look for color inspiration wherever you are! This time of year brings many thoughts and focus on trees with the changing season, the autumn colors, and time to "fall back".When my husband and I visit the mountains this time of year I love seeing the oak trees, acorns and oak leaves that fall to the ground. 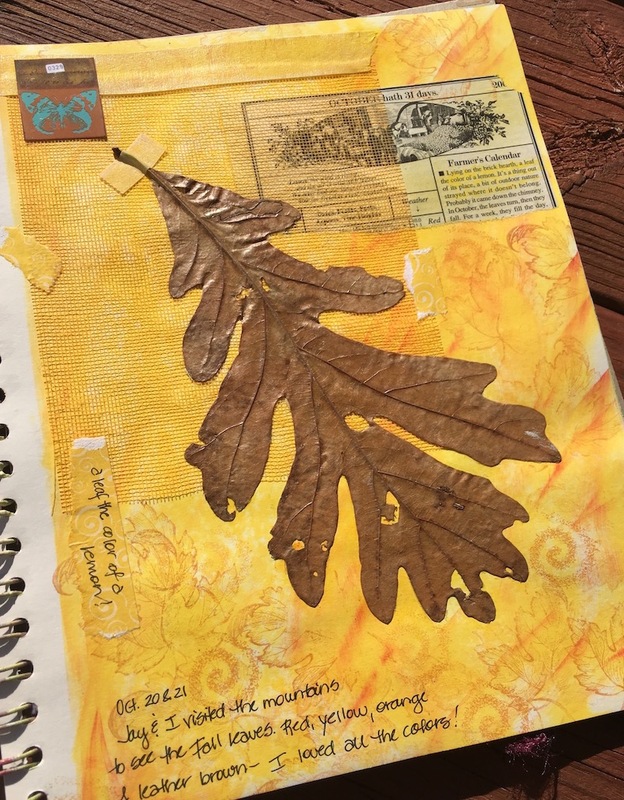 I'm partial to the oak leaves found in our favorite places because their towering branches symbolize strength. 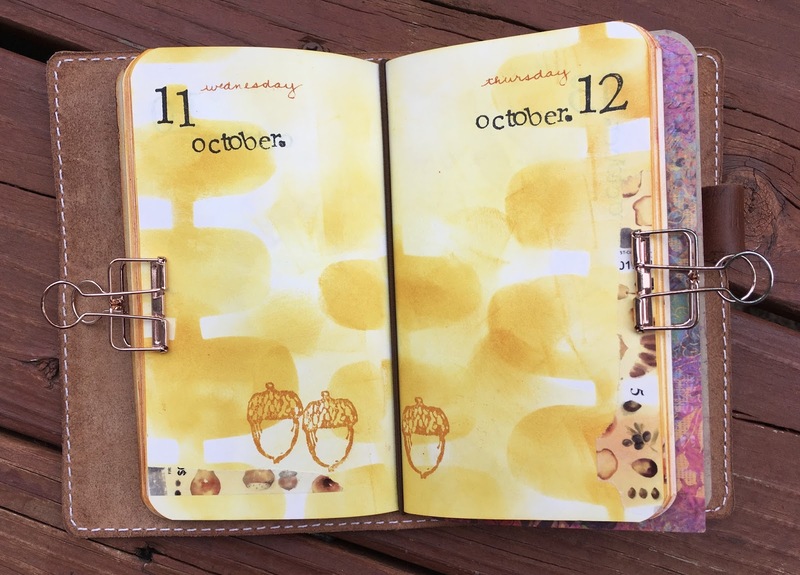 Yellow is my go-to color to signify my joy when among the leaves. I hope you'll try sketching, stamping, painting or gluing a real leaf in your art this month! 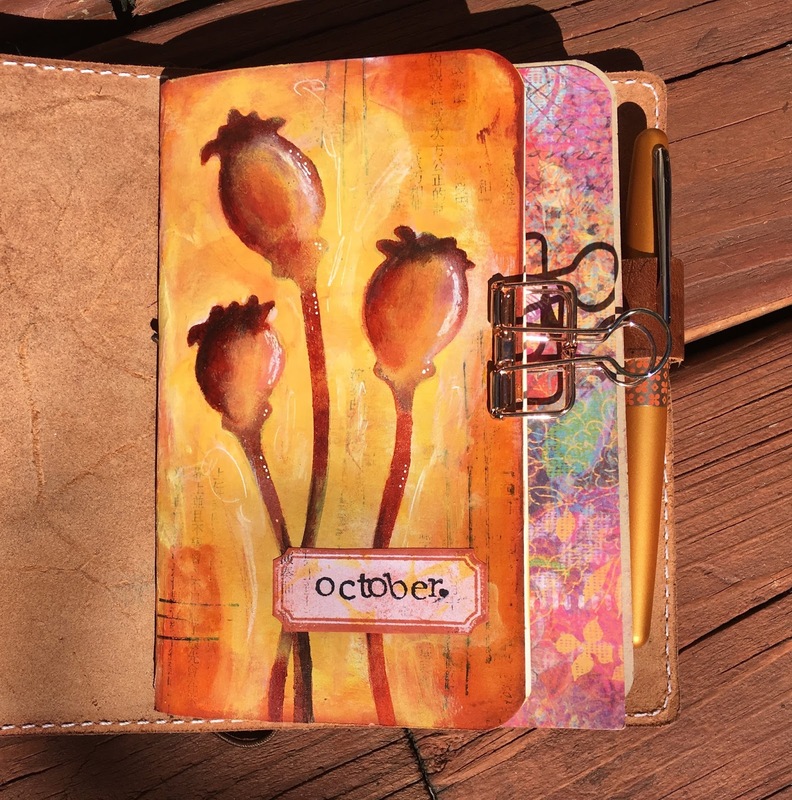 Cover of my November monthly insert. 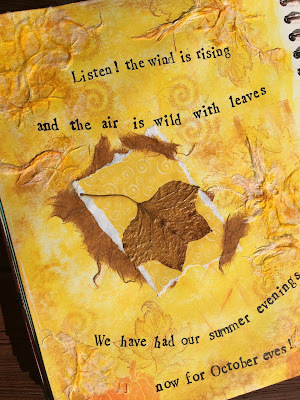 Acrylic paint and torn papers. 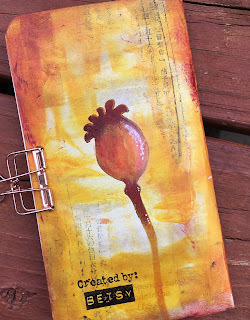 Back cover with acorn stamp. 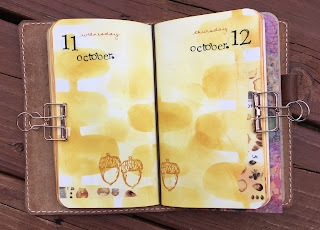 Some yummy background color for documenting my November days. 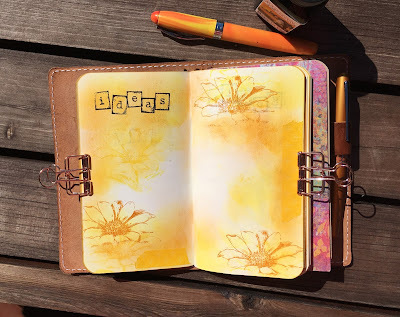 Documenting a weekend in the mountains. Some watercolor in my Hobonichi Techo. 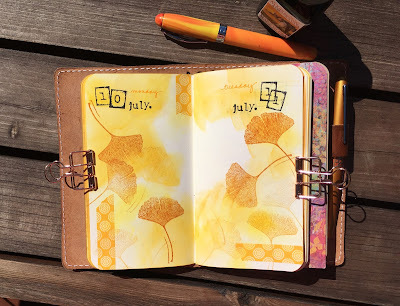 Continuing with this month's COLORS -- yellow ochre, orange and burnt orange -- I'm sharing my tiny inspirational journal. I chose a quote then used background stenciling, decorated papers, stabilo pencil and a hand-carved stamp on coffee filter paper. Try using this quote and these colors to represent hope and encouragement in your journal! 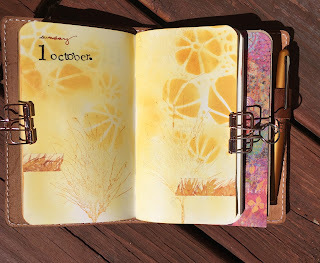 My October planner was inspired by my love of pods and the colors of fall: yellow ochre, orange and burnt orange. 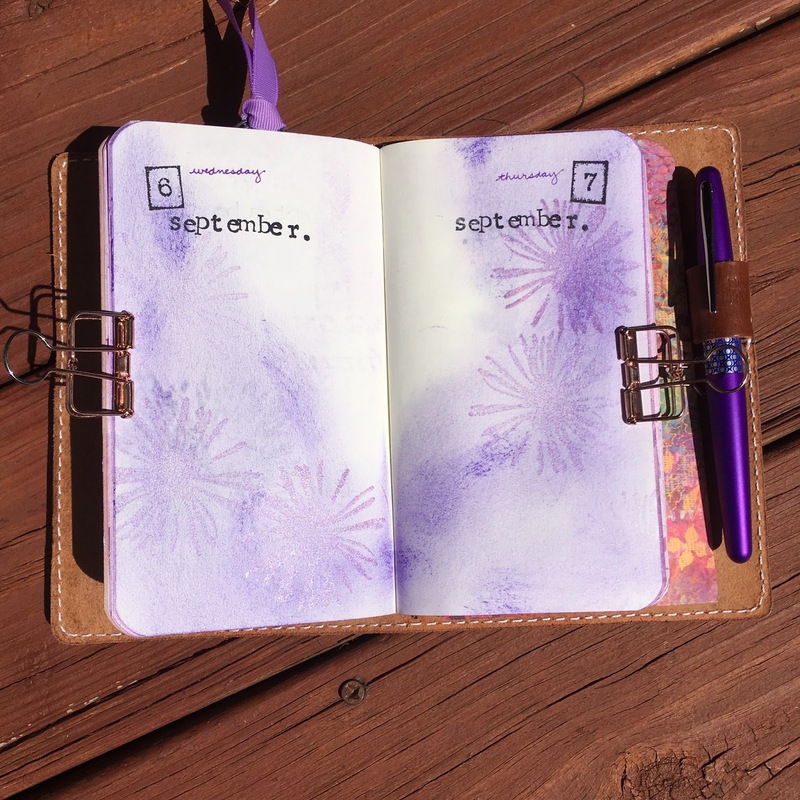 These colors represent hope and positivity as well as encouragement and change which we all seem to be seeking these days. 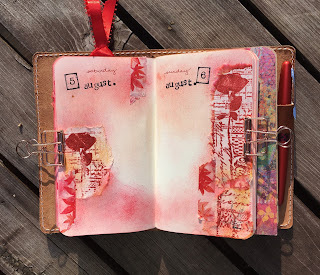 I used stencils, masks, rubber stamps and hand-carved stamps for this month's pages. 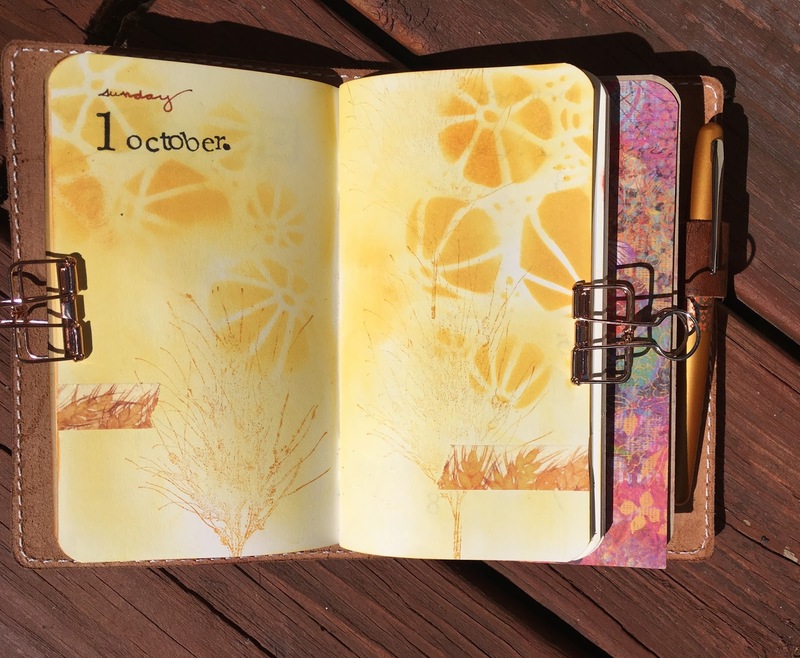 Hope you try it yourself and record your special story in October. 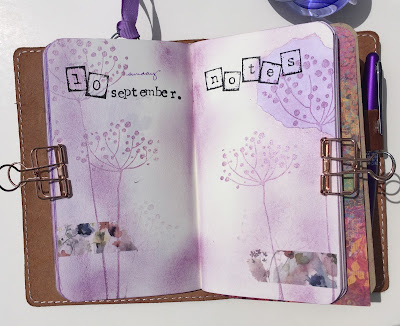 Five months of colorful inserts! 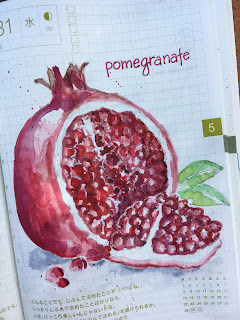 I challenged myself to watercolor "Summer Treats" everyday in August! 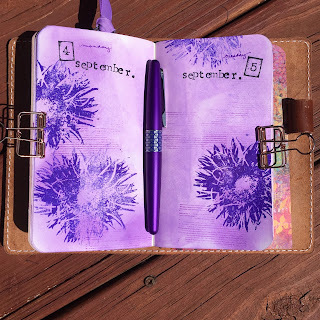 My September traveler's notebook insert was inspired by the month's birthday flower, the purple aster. PURPLE is associated with spirituality, imagination and increased creativity. 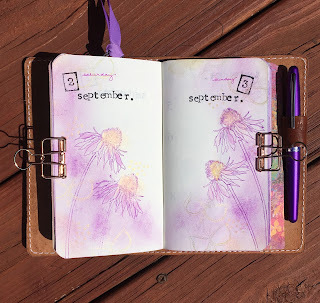 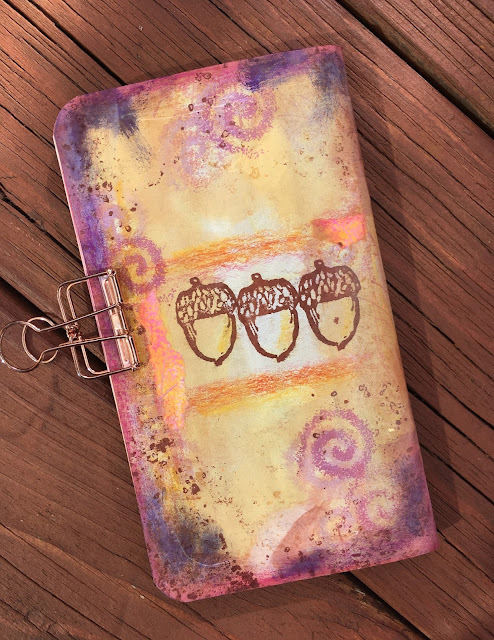 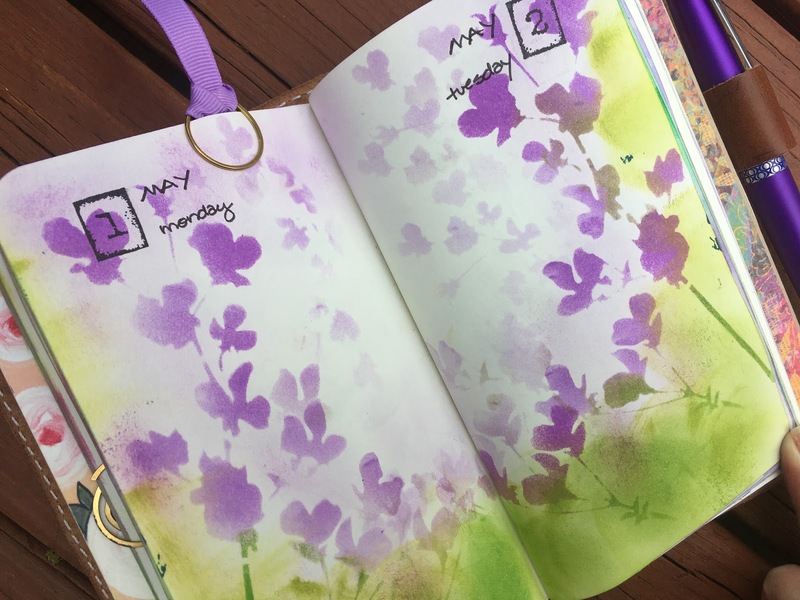 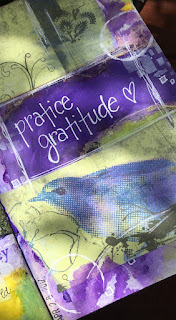 I challenge you to add purple to your art journal this month and see your imagination soar! If you'd like to see how easily you can decorate your inserts, see my video showing these simple techniques. 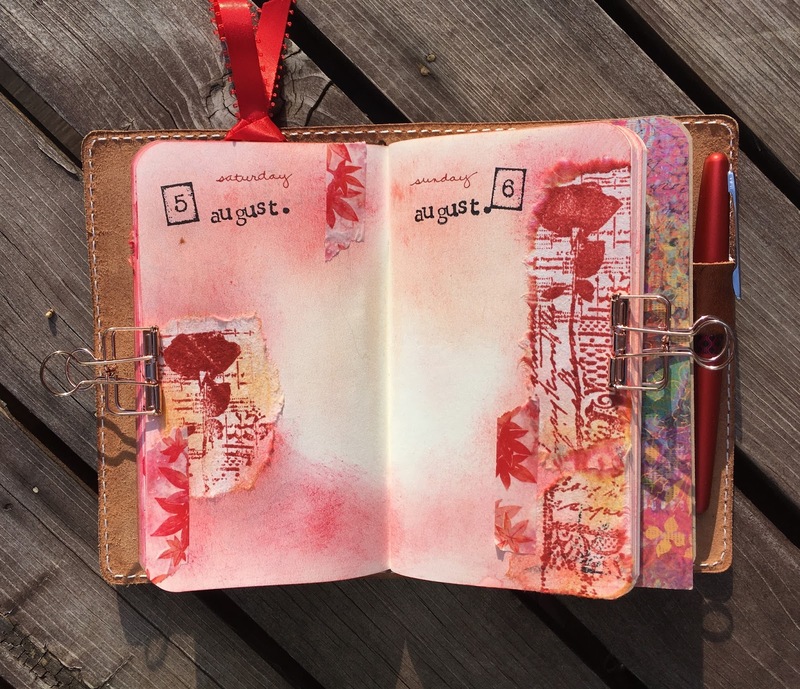 RED is the color of love, radiance and passion. 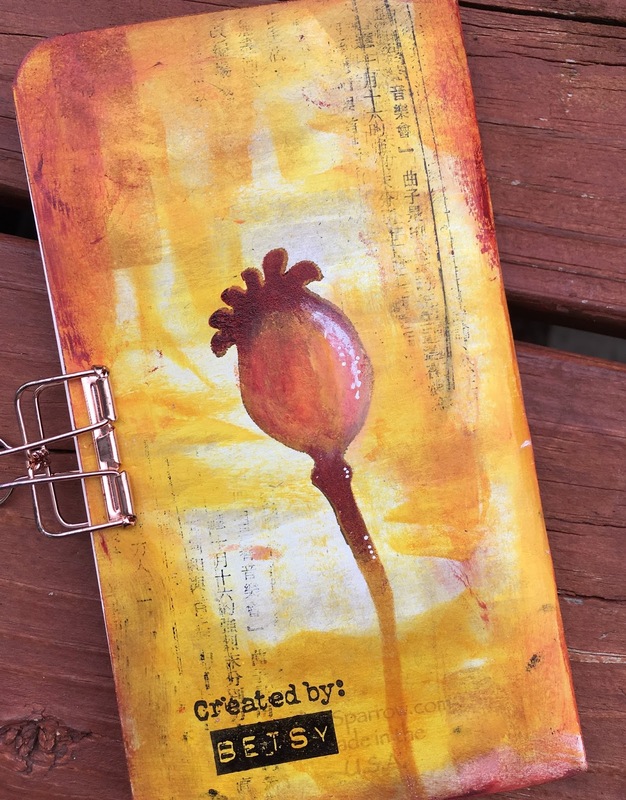 Use red to express what you love to do in an art journal -- it will feed your soul! 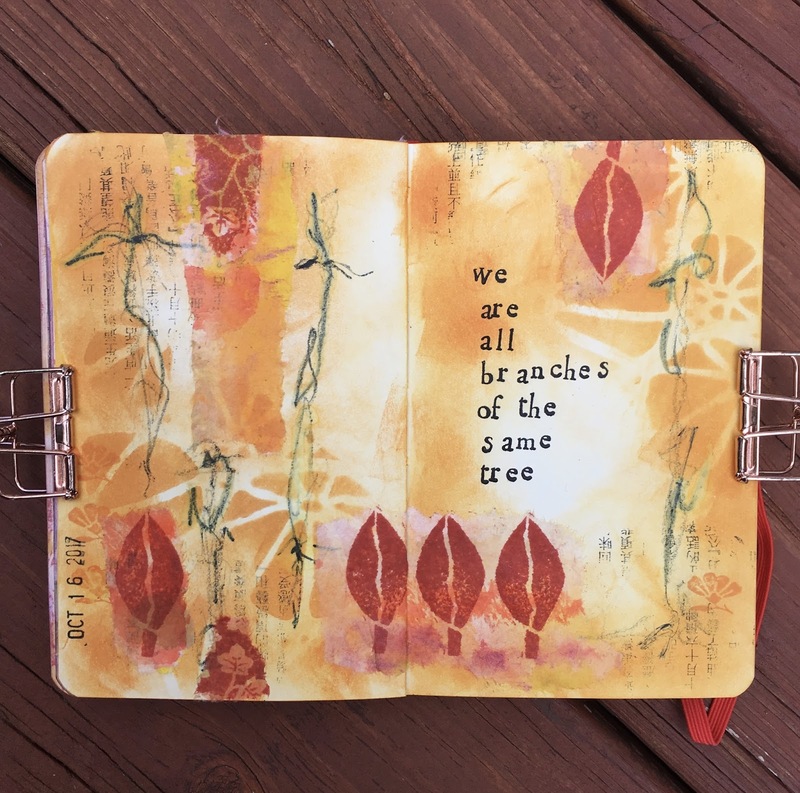 I am once again challenged to create art with a broken wrist from a recent fall. 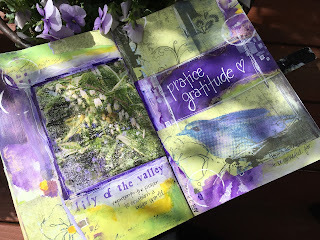 Some of these pages were created from a positive viewpoint of what I could do with my wrist, not what I could not. 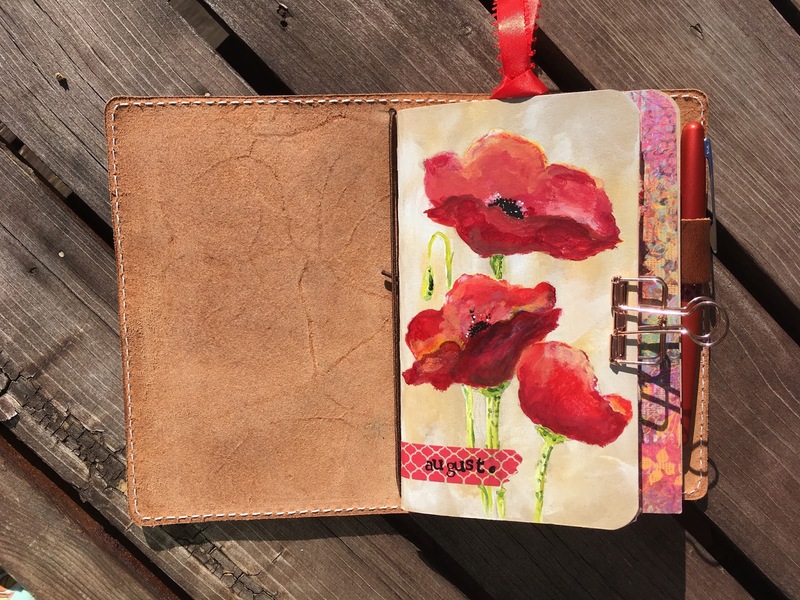 I am sending some poppy love to you this month! I added a bit of napkin - such a fun trick. 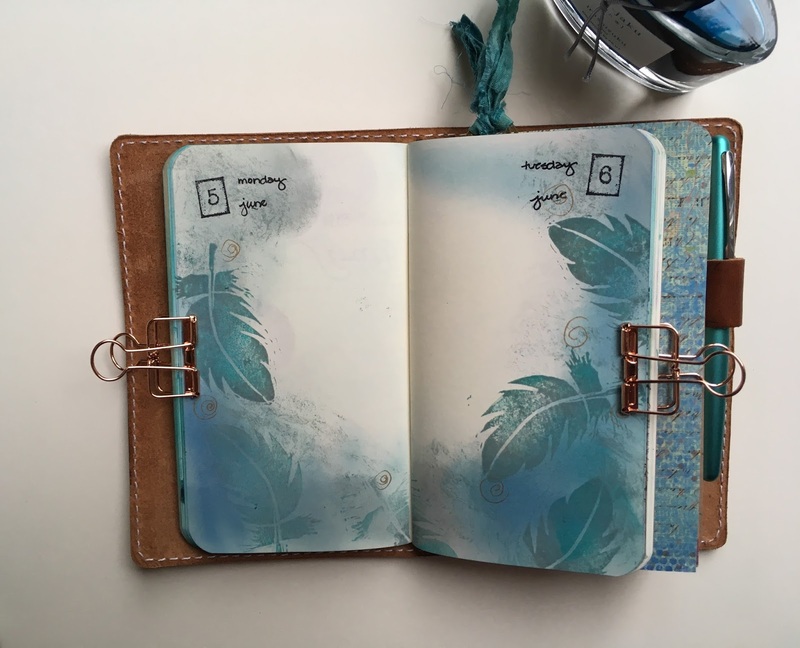 You can challenge yourself by selecting a limited number of supplies and creating a page with only those supplies. You can see my “HAPPY place” page used blended reds expressing my love for creating art. Even though the page is not “perfect”, it’s a perfect way to express my passion! 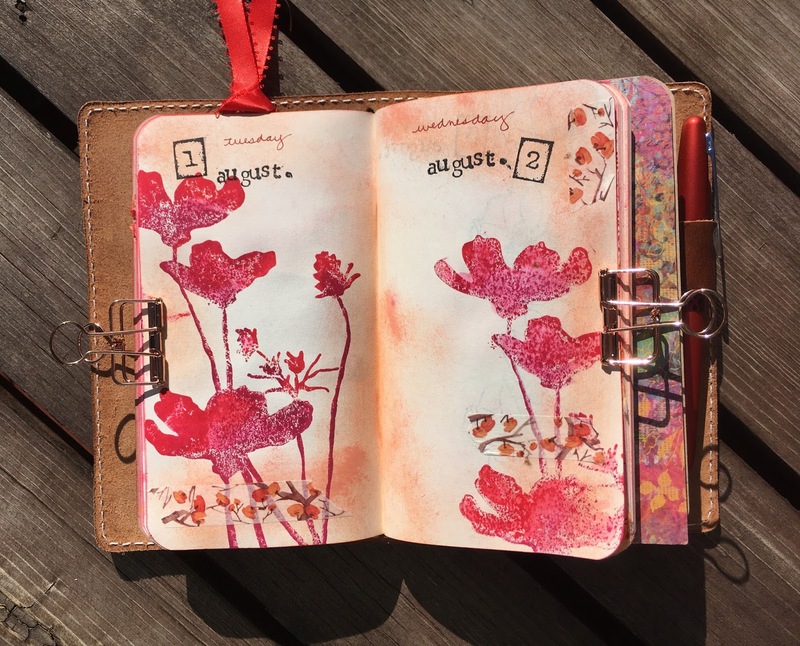 One more lovely red entry in my Hobonichi Techo. 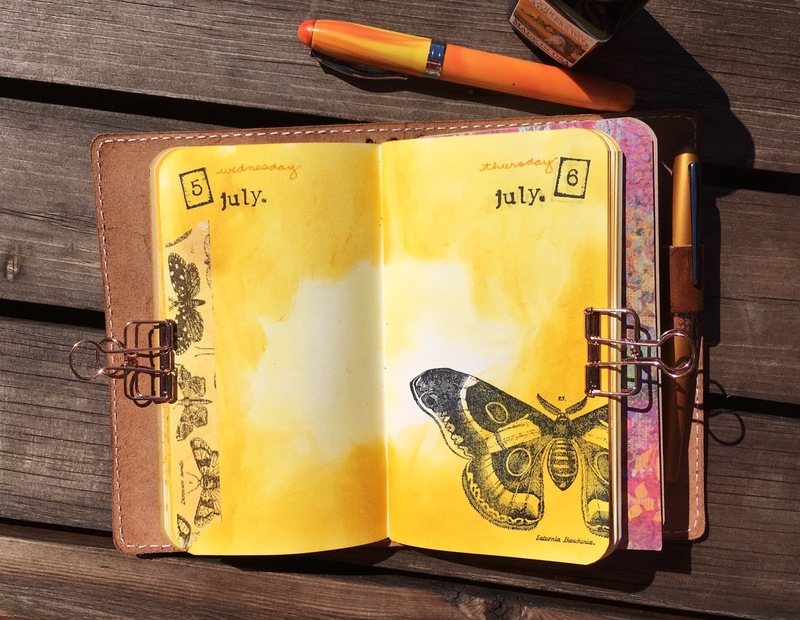 My July color is YELLOW - the most brilliant of all the colors. It is the color of happiness and optimism, of enlightenment and creativity, and sunshine. 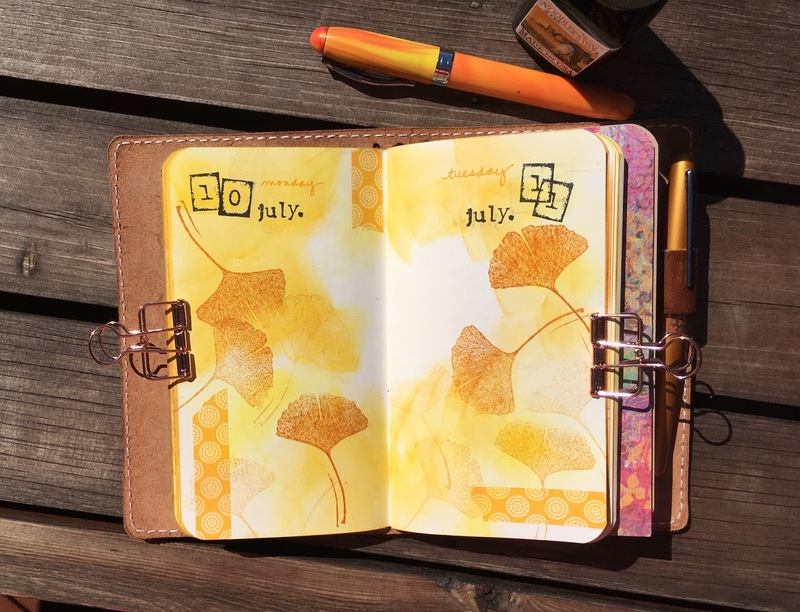 The theme this month is botanical and anything that brings a ray of sunshine. 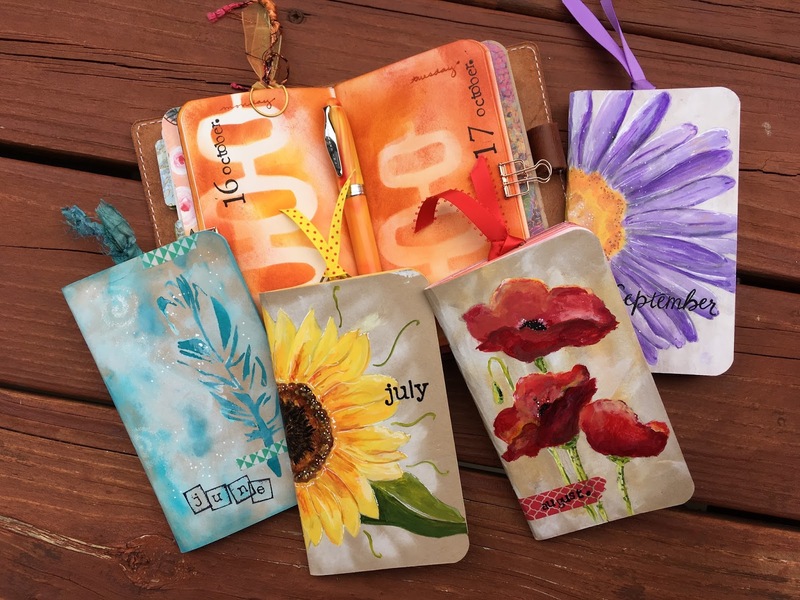 Take some time to shine in your art journal this month! 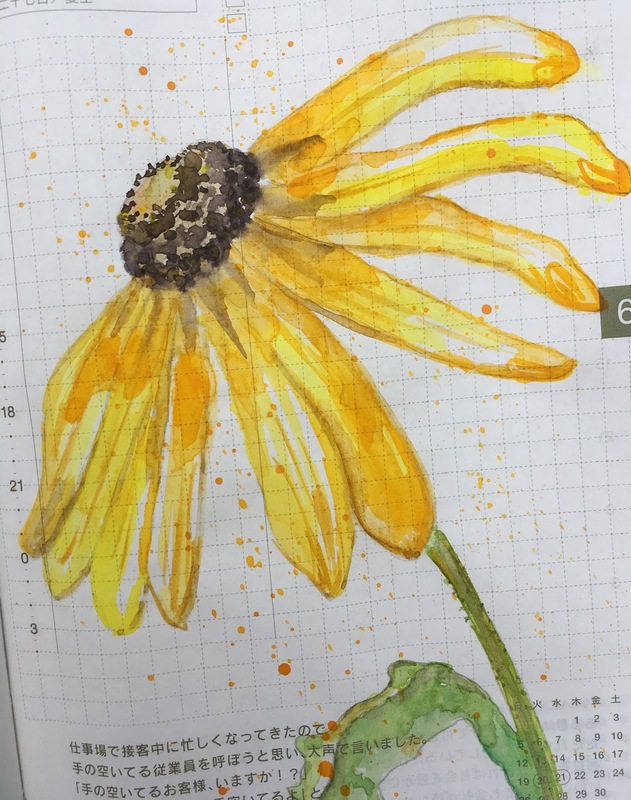 Black-eyed Susan watercolor in my Hobonichi Techo. 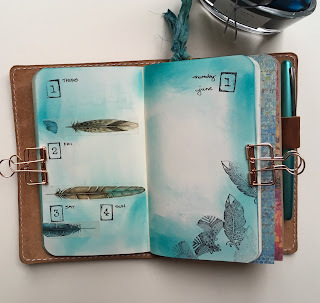 This month I've chosen turquoise as June's color as it represents a calming energy, increases intuition and may assist with emotional balance. 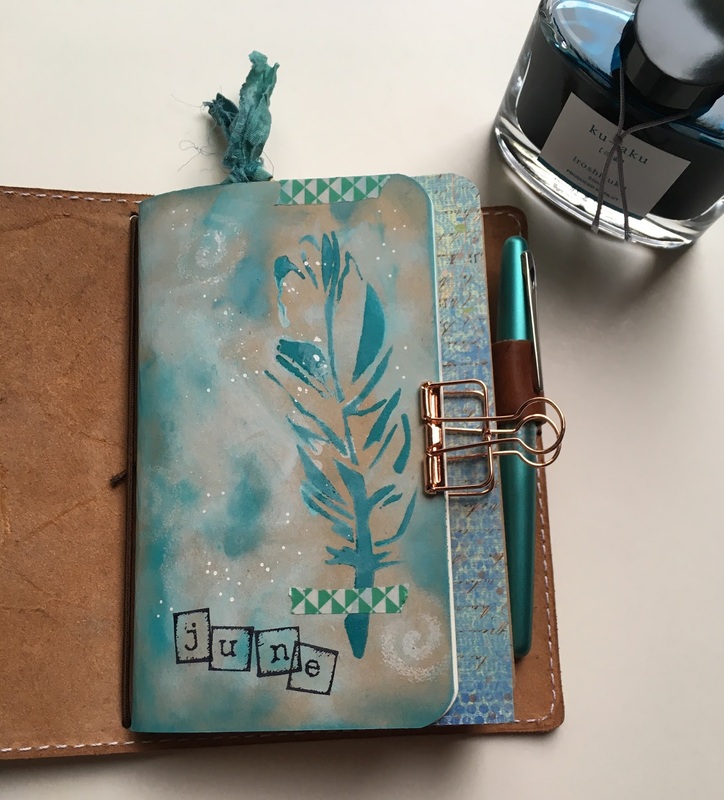 I felt the need to add a theme as well so chose the quote "with brave wings she flies". 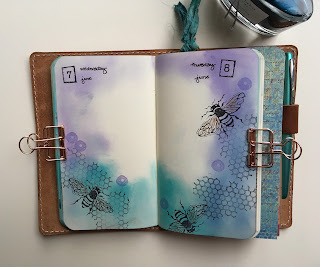 I gathered all my stamps, stencils and washi tapes with wings, feathers, dragonflies, bees and birds to inspire me. 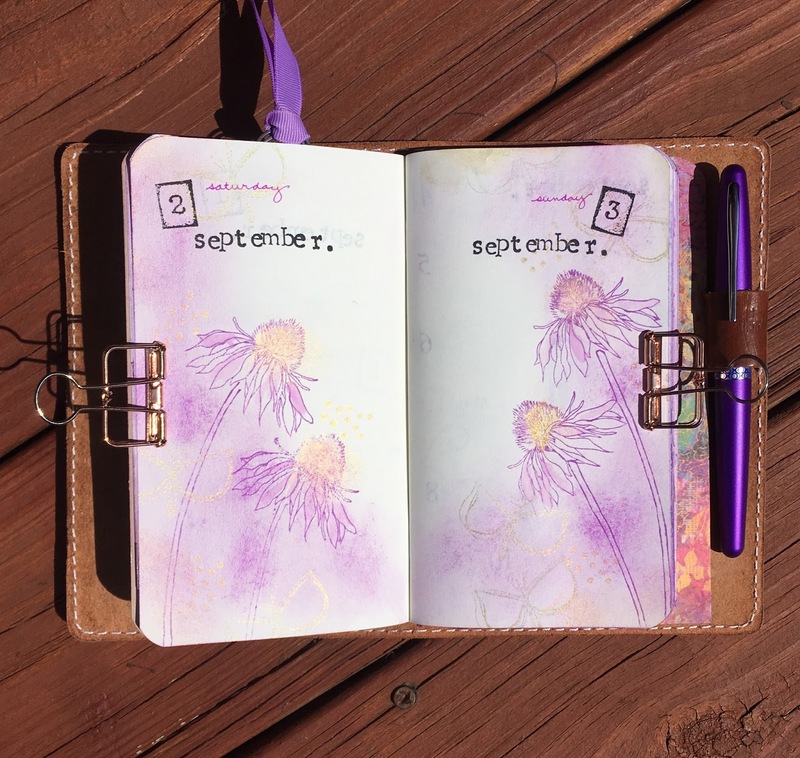 It's a very calming color as well as an inspirational quote. Here's a peek of this month's journey. 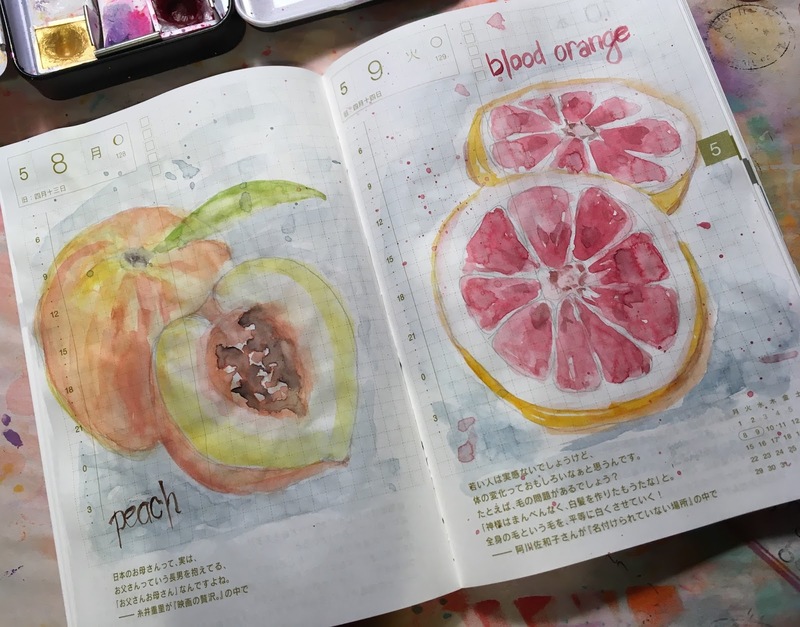 I've also made a commitment to watercolor in my Hobonichi Techo everyday! 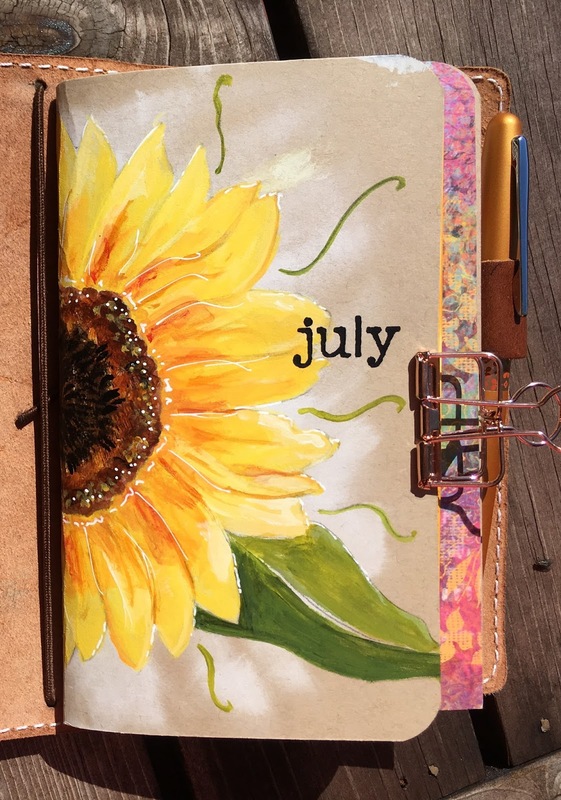 June's focus is flowers. I'm enjoying my little Hobonichi Techo planner which I use as an art journal. 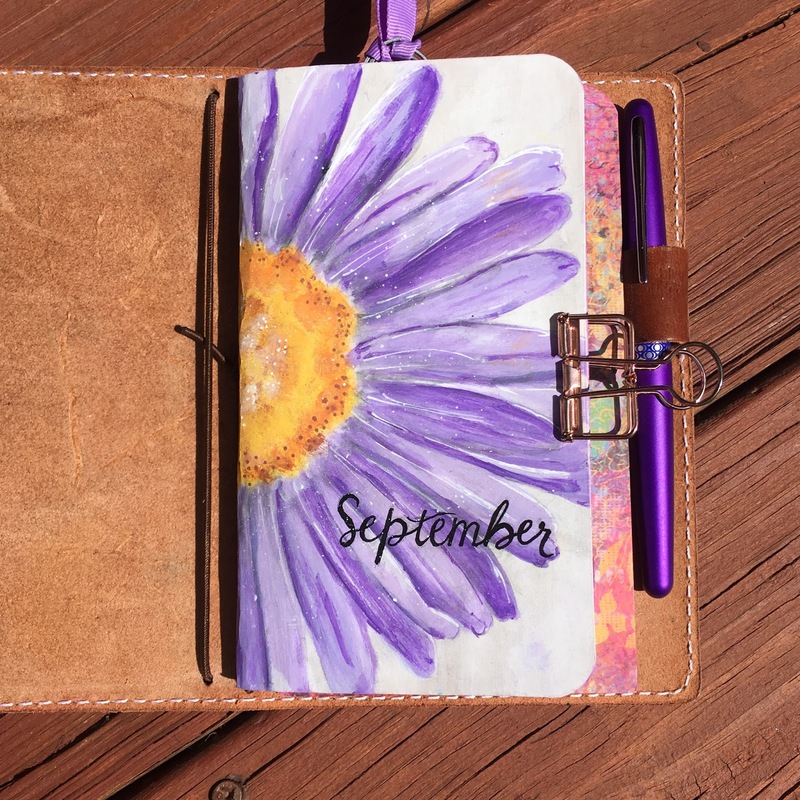 The small size almost guarantees that I can art journal everyday. 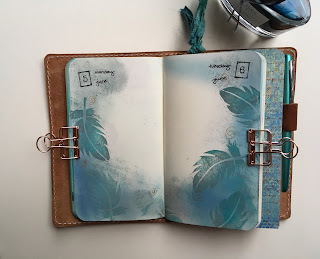 I especially like watercolors on the Tomoe River paper - it gets all crinkly for a very much loved look and feel! 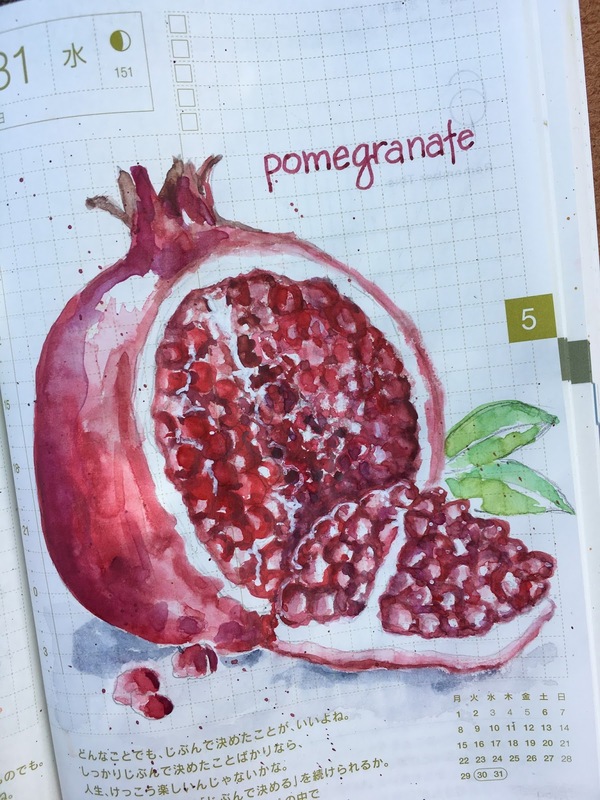 Here are a few of my favorites from the May 2017 challenge: Yummy fruit. Hope you'll join in and follow me on Instagram for this fun journey! 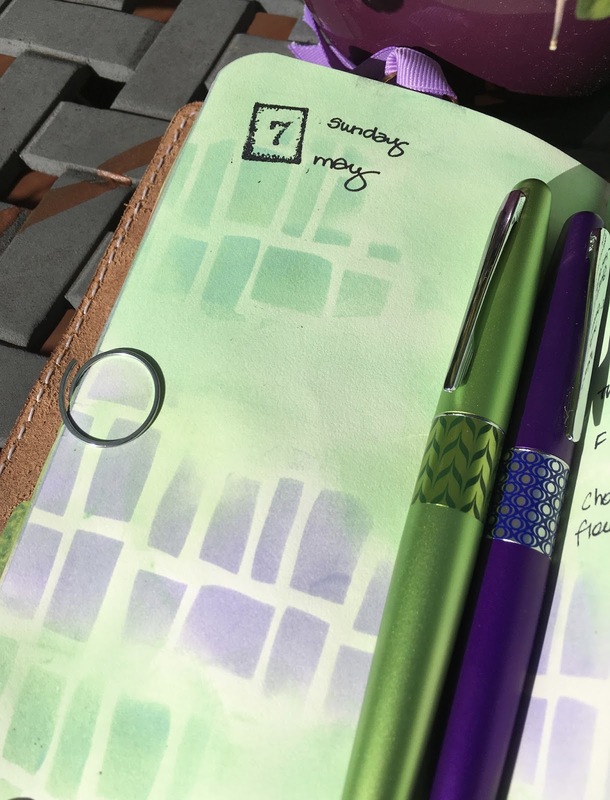 I decided to combine the green from March with the violet from April to create this month's color palette. 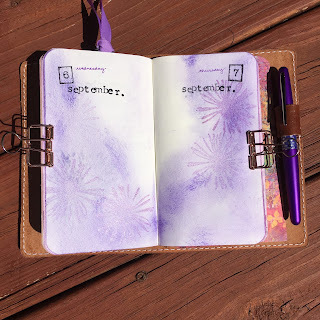 I like to get color inspiration from nature and everywhere I look I seem to be seeing this combination. 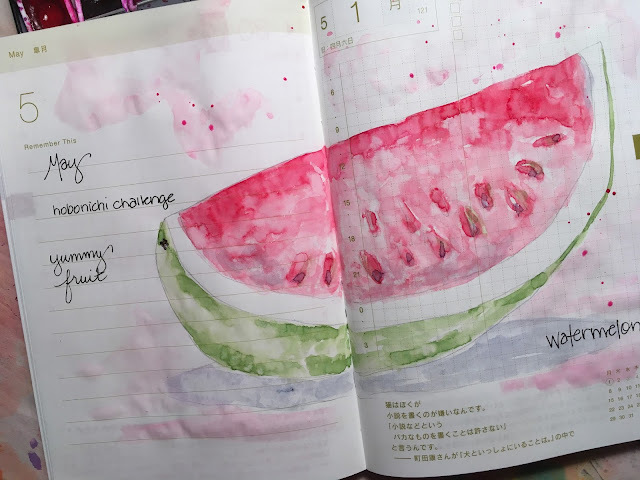 These colors also represent the colors from Archangel Metatron, who has been guiding me for the month of May, so I'll be looking for a sliver of watermelon tourmaline to complete my colorful month!